Reason #5: Unfortunately for you folks, Wassamatta_u is one of the most prolific posters on Atlas Quest. Also unfortunate for you, he also has absolutely no sense of shame. 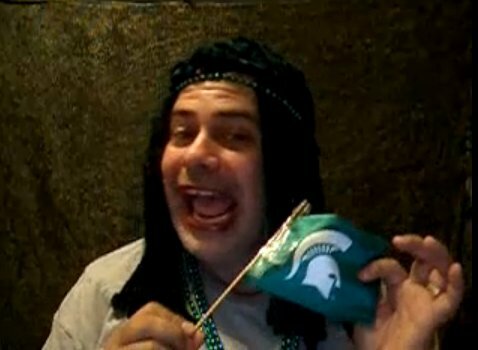 Below, you'll find a video of him singing the MSU fight song. Ear bleach may even be appropriate, but we don't have that. We just recommend you turning the volume on your computer down if you dare to hit the play button. There's a reason Wassa's name is on our patented eye bleach. He's also the reason that eye bleach is considered one of the "10 letterboxing essentials." Order yours in the AQ Marketplace today! To clarify: That isn't me. That's TrailTracker. That's my story and I'm sticking to it. I had no idea how much you and TrailTracker look alike, wassa! Hey, I thought I saw this on "America's got talent" the other night. He came in second from the bottom. Friggin' hilarious mon! Is that Osamawassu or his girlfriend from MSU? I'm afraid I don't see the humor here. It is a distinguished, reverential salute to a fine institute of higher learning, performed by a talent of the highest magnitude. Eye Bleach? Pshaw. This is most disturbing. The only thing I took away from this train wreck was how *not* to apply lipstick.